Despite all the great features that come with every iOS device, people still find something they want to tweak. To get that extra degree of convenience in accessing your iPhone’s settings for example there’s SBSettings which enables access in a single swipe. Unfortunately this is a jailbreak and aside from possibly reducing the system’s stability, this exploit doesn’t work on the newer iPhone 4S. Jeff Broderick came up with a solution and simply called it iPhone Settings Shortcuts. Instead of breaking and entering into a device’s root directory, this tool works more like a web app. You go to his site using your iPhone, select icons for specific settings, and then install. The icons look great too and uniformly fit into the UI. The designer even used some of the default ones. There’s actually a program at the App Store called Icon Project that can basically achieve the same result. But that app costs 99 cents, iPhone Settings Shortcuts is free. 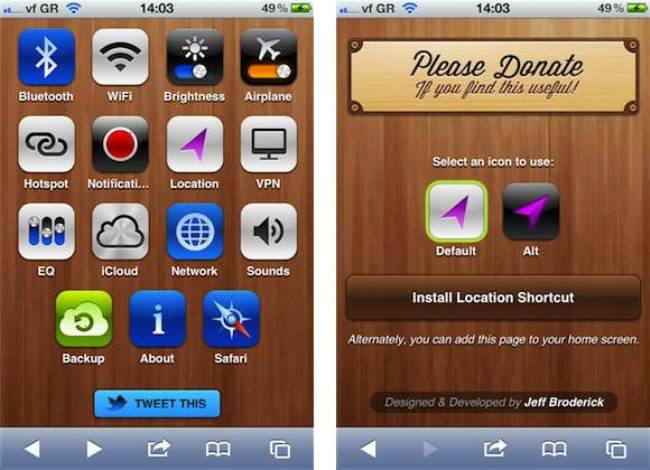 Despite the name, Jeff’s tweak will actually work for any iOS device.